washington fly fishing: "This Is My Last Cast"
"This Is My Last Cast"
This robust sea-run cutthroat took a Chum Baby fly on the last cast. Sometimes it happens this way. We had been fishing all morning on a softly ebbing tide. There was plenty of bait around, and the trout and sea ducks were feeding on them close to shore. We had caught a few nice smaller trout earlier in the day. But by mid-day the trout stopped showing. And we felt like they had moved on in the currents along with the bait. It was a minor tidal exchange day, with only a few feet of difference between tide heights all day. So we took a nice lunch break, and waited for the tide to turn. Something that I really like is a fresh incoming tide, fishing it from the very beginning of the flood. That cold, plankton-rich water is so refreshing in the summer heat. And it brings the food and the fish in close sometimes. This makes a difference when the sun has been heating up the shallows and exposed flats between tides. The trout will avoid the warmer water areas. Once that cold water floods in again, it brings along with it the bait and the feeding trout and salmon. As we worked into the river-like tidal flow, we saw a few feeders showing again. Birds, fish and seals all convening in the hope of a meal. We changed flies fairly frequently too. If you know that the fish are there, and they have seen your fly a few times, and they aren't taking the fly, Change flies. Often. 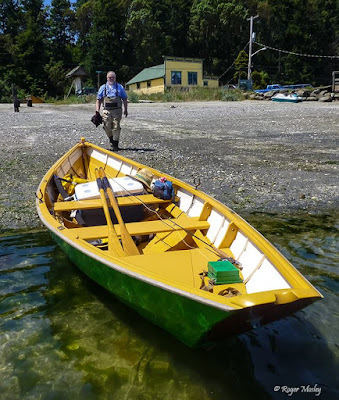 Veteran Puget Sound Fly Fishing Guide, Leland Miyawaki. Even in the best of conditions, sometimes we don't always get what we want. Most of us learn this fairly early in life. Some of us need a reminder. We fishermen seem to get frequent reminders. This entire afternoon session was torturous, with beautiful conditions, bait and feeding trout in front of us, and I was guiding a good caster who could put the fly in the game. We worked hard, changing flies, moving along the beach, using every presentation we could. There were a few light grabs, probably from smaller trout, or smolt. But no love. Finally Thomas stopped and stared at the water for a moment. And then he announced: "This is my last cast." And that's when the love came. We have enjoyed plenty of warm sunshine and dry days recently. But all of that is going to change tonight, and for the week or so to come. It's going to cloud up here again, and we're going to get some real, good rain. The daytime temperatures will be in the 60's. It's going to feel like spring again. I am looking forward to how this feeds into the estuaries and saltchuck. The cooling effect will help our fish, and our fishing. This is the upside of what we call the annual "June Gloom."